The deepest blue waters of Lac Léman (known to English speakers as Lake Geneva) and the highest Alpine peaks come together at Montreux, Switzerland's most charming small city. Fairmont Le Montreux Palace is part of the charm, a landmark on the lake since 1906. The hotel is the perfect pied-a-terre for exploring the town and a region full of unexpected delights, which begin at the waterfront promenade and extend up to the mountaintops. Jazz put Montreux on the world map. Every July since 1967, the city has hosted the Montreux Jazz Festival, now the world’s second largest festival of its kind, encompassing rock, electronic and other musical styles under the global jazz label. And it’s no surprise that many performers fall in love with Montreux. After playing the festival, the rock band Queen was so enamored with Montreux they recorded seven albums here in a recording space they bought, Mountain Studios. Today, studio visitors, now called Queen Studio Experience, sign the wall to leave messages for the late Freddie Mercury and his bandmates. Montreux has become a fan of Mercury as well. 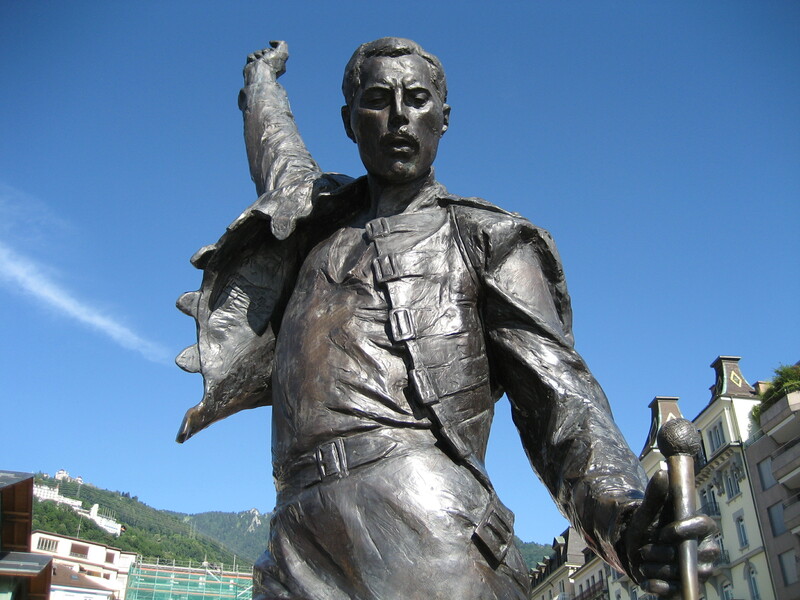 You can’t miss the 10-foot-tall bronze Freddie Mercury on the promenade overlooking the water. Super fans might want to book the Freddie Mercury suite at Fairmont Le Montreux Palace for the ultimate homage. The lofty mountains and glacial lake are visible from the moment you walk out the door of the hotel (and from select rooms). But there are many different ways to frame these spectacular vistas. 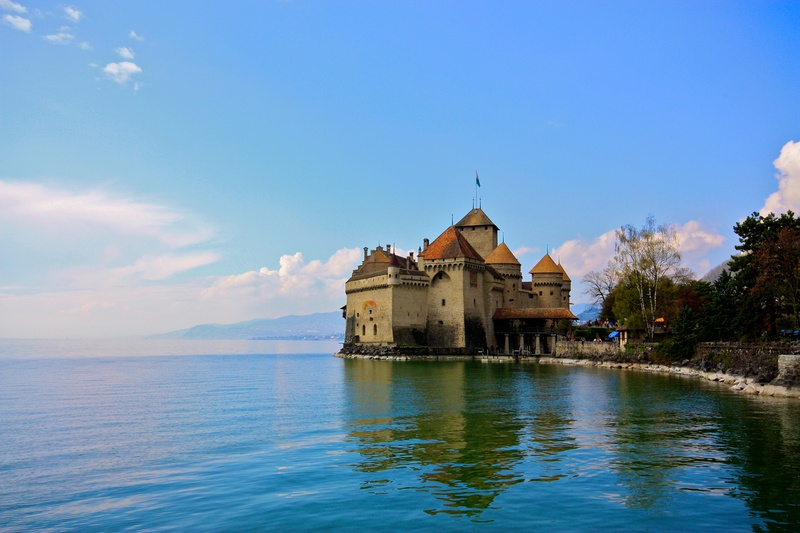 Start at Chillon Castle, located three kilometers from the center of Montreux. Perched on a small island close to shore, the 12th-century castle looks like it belongs in a fairytale. But it has a long history thanks to its strategic location. The dichotomy is visual with the mountain-facing side clearly a defensive fortress and the lake side built for courtly luxury. The British poet Lord Bryon etched his name on a dungeon pillar and wrote The Prisoner of Chillon, a narrative poem about Bonivard, a monk who was imprisoned here. Nowadays, only visitors wander through the beautifully restored 25-building compound with views of the lake from tower windows. 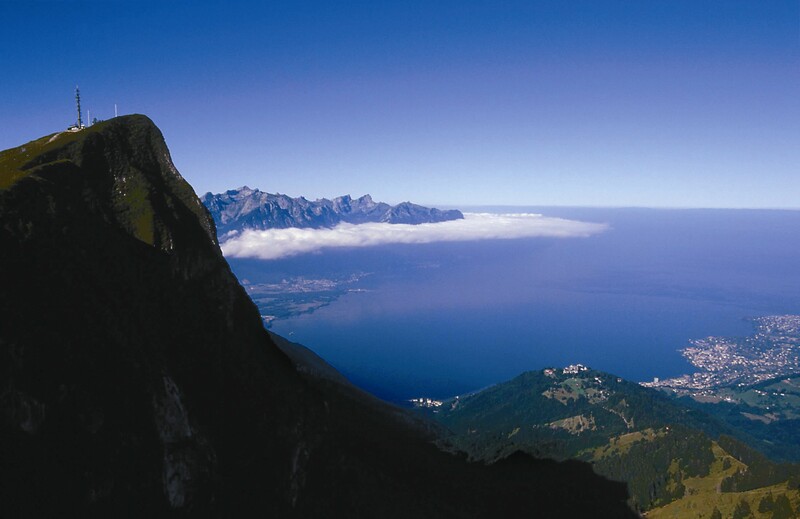 For a sky-high view, take the vintage cogwheel train from Montreux to climb 2,000 meters up to Rochers-de-Naye. The train takes just about an hour and there's a casual restaurant and visitor center at the top. You can spend your time drinking in the views of the lake, the Alps and enjoying La Rambertia, a high-Alpine botanical garden. Walk or bike along Montreux's waterfront promenade all the way to the delightful town of Vevey just six kilometers from Montreux (driving is an option, too, and takes about 10 minutes). 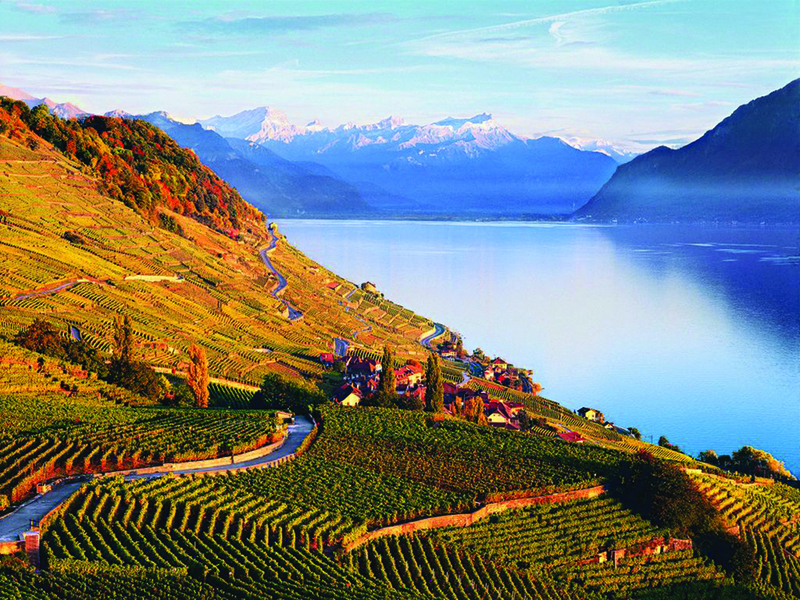 Some refer to the two towns as twins (they’re about the same size), but the pace in Vevey is a little slower, which may explain why such celebrities as Charlie Chaplin and Ernest Hemingway once called it home. Visit on a Tuesday or Saturday to shop at the town's famous market. The square is packed with vendors selling bundles of flowers, local cheeses, sausages and fresh pastries. During the summer Saturday market, sample wines from regional vineyards and converse with vintners, who may be dressed in traditional Swiss garb for the occasion. The price makes this wine tasting even more appealing: Pay for one glass and all additional samples are free. If your visit falls outside of a market day, the Rue du Lac pedestrian shopping area is lined with interesting boutiques and antique shops. 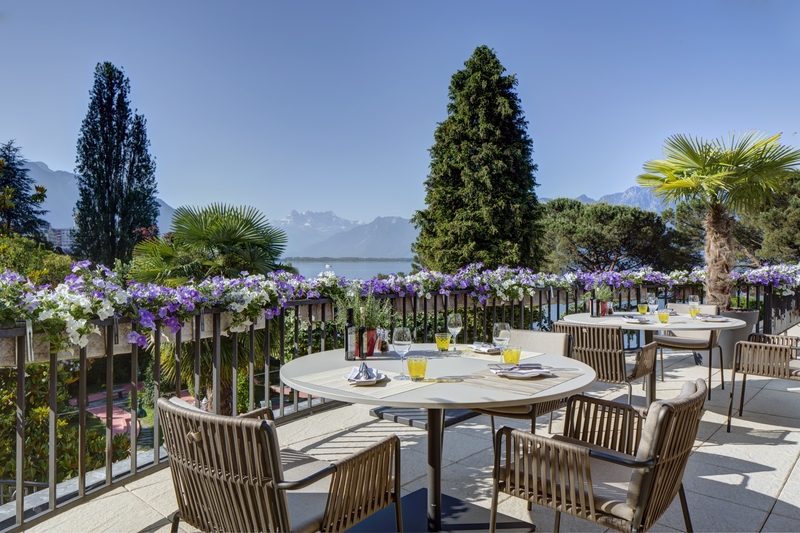 Before heading back to Montreux, stop for a meal at Ze Fork, a popular restaurant overlooking the lake. The stunning views are satisfying, but you'll also enjoy the menu of memorable interpretations of traditional French and Swiss dishes, such as sea bass with a lemongrass and saffron sauce or roasted pigeon. If you have a love affair with chocolate, there’s a place about 35 minutes from Montreux to indulge your passion. Maison Cailler in the village of Broc is a sensory delight for chocolate lovers. Start at the modernist visitor center to discover your “chocolate personality” by tasting a series of samples, then move on to the Art Deco factory. More than just a factory tour, you’re treated to dioramas, hands-on exhibits, a bit of history and a chance to see rich confections being made. For the chocolate lover who is equally enamored with cheese, the Chocolate Train leaves Montreux three mornings a week during the spring, summer and early fall, bound first for Gruyères, home to the famous cheese of the same name. At this stop, passengers disembark for a tour of a cheese-making factory and Gruyères Castle before heading to Broc. For many visitors, there’s nothing better than watching the sun dip below the Alpine horizon as they gaze across the placid lake. Terrasse du Petit Palais provides a delightful setting to savor a local wine, dine on fresh seafood and indulge in a delectable dessert, such as fig and honey sorbet with cheesecake. It’s a romantic way to end the day. Turn your Montreux dreams into reality. Contact the hotel concierge at concierge.montreux@fairmont.com for help planning your next visit.